A solid sequel to the speculative sci fi Post-Human series! Simpson, David. Inhuman. Post-Human Media, 2014. By the end of the first books in the series, things had gotten super intense. James Keats and the AI had assumed godlike powers, and driven off an army of trillions. It seemed to me that the series was dangerously close to the ‘no threat can possibly top that!’ moment, a moment, needless to say, that affects quite a number of series of this sort (as well as fantasy series, in fact). Once the world/universe has been saved from the likes of a demigod/ginormous army/etc., how can any plausible greater threat still be lurking, ready to jump out from behind a bush or whatnot in book five? I was surprised to find Simpson manages to postpone that moment, and delivers quite a worthy opponent/crisis in this, the fifth book. 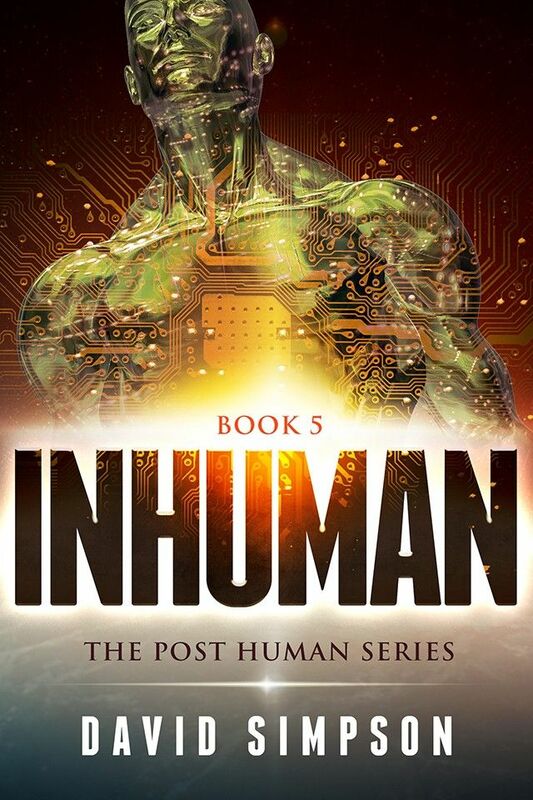 Best of all, Inhuman combines the most interesting elements of the outlying fourth book (the one about the AI’s ethical test) with the ongoing implications of Craig et al’s actions earlier in the series. In this installment, we learn more about the nature of the ‘multiverse’, an idea that everyone seemed to have forgotten about after Craig’s little venture into alternate universes in book one, and begin to suspect the true archenemy is someone even worse than One. That’s about all I can say about the content without spoiling stuff; suffice it to say, this is an entertaining tale that will keep you turning pages. But how will you react to the end, I wonder? Because this is the ‘Empire Strikes Back’ effect times a trillion: going from a high point (the endings of books three and four) to a dark valley until, presumably, the sixth book delivers a happy resolution of some kind. Here’s the problem, though: at the end of Empire Strikes Back, a happy ending to the overall series seemed a bit unlikely, but certainly not implausible, since the rebels were mostly still alive and the main characters had even learned some valuable lessons, arguably, in how to face the superior power of the Empire. At the end of Inhuman? Not to spoil it, but a whole lotta farms have been bought! How can one realistically hope and expect a happy resolution when things have reached such a bleak point? And while I’m venting about the false notes in an otherwise entertaining and even thought-provoking series, let me just say: why do most people seem convinced that, barring extraordinary circumstances, an artificial intelligence will “inevitably” be a mustache-twirling supervillain? Oh, I admit that sort of thing is surely a possibility, but not a very well thought-out one: why would a being with the knowledge of the (multiple) universe(s) at its incorporeal fingertips decide to wipe out all life 99.99% of the time? In any case, things are looking bleak for our intrepid band, and despite the ranting above, I’m quite curious as to how Simpson will manage to top the ‘darkest hour’ feel of book five and sustain tension and interest in book six! This message brought to you by Zhaoyun, skeptic of gods out of the machine since forever and contributor at NOAF since 2013.